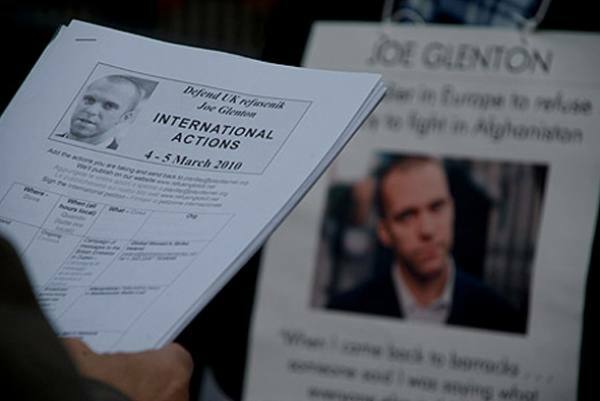 (05.03.2010) Anti-war groups in Russia, United States, Germany, Turkey, Britain, Italy, Ireland, Greece and Polen are calling with broadcastings, pickets and rallies for all charges against Joe Glenton to be dropped. Joe Glenton should be released from military service immediately. On March 5, Joe Glenton faces court martial and possibly two years in jail for going AWOL (absent without leave). On March 5, 2010, British Afghanistan war refusenik Joe Glenton was sentenced to nine months in jail for having gone AWOL.